Is HR Ready for Chatbots? Recent innovations in AI and Natural Language Processing technologies have the tech industry buzzing about the potential impact virtual assistants and chatbots can have on increasing the efficiency of service organizations. 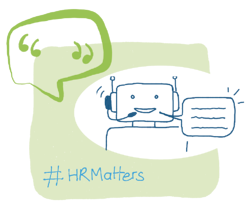 As HR departments continue to look for ways to free up their teams from administrative tasks, could chatbots be a real possibility? Our latest Tech Take will help you better understand what chatbots are, the challenges chatbot technology faces when dealing with HR-specific use cases, PeopleDoc’s vision of the future of chatbots for HR and our approach to incorporating this technology into our platform. Enhance your tech know-how and download our quick overview, PeopleDoc Tech Takes: Chatbots.